﻿ 1 John 2:7 Beloved, I am not writing a new commandment to you, but an old commandment which you have had from the beginning; the old commandment is the word which you have heard. Dear friends, I am not writing you a new command, but an old command that you have had from the beginning. The old command is the message you have heard. Dear friends, I am not writing to you a new commandment, but an old commandment that you have had from the beginning. This old commandment is the word you have heard. Brothers, I write no new commandment to you, but an old commandment that ye had from the beginning. The old commandment is the word that ye heard from the beginning. Beloved, I am writing you no new commandment, but an old commandment which you have had from the beginning; the old commandment is the message which you have heard [the doctrine of salvation through Christ]. 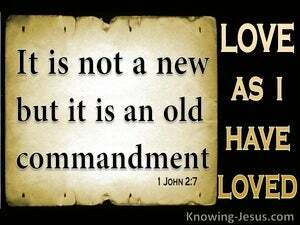 My dearly loved ones, I am not writing to you about a new commandment, but about an old one. [It is the one] you had learned about from the beginning. [Note: This is the commandment to love one another (3:1: II John 5) which Jesus had taught his disciples during His earthly ministry. See Mark 12:31]. This old commandment is the word [of God] which you heard [previously]. Beloved, I write no new commandment to you, but an old commandment, which you have had from the beginning; the old commandment is the word, which you have heard from the beginning. My loved ones, I do not give you a new law, but an old law which you had from the first; this old law is the word which came to your ears. My brethren, I don't prescribe you any new commandment, but the antient precept which you had from the beginning: and that is no other than the word which was originally delivered. Brethren, I do not write a new commandment to you; but an old commandment, which you had from the beginning. The old commandment is the word, which you have heard from the beginning. Beloved, I write no new commandment to you, but the old one which you had from the beginning; the old commandment is the word which you have heard. Dear friends, it is no new command that I am writing you, but an old one that you have had from the beginning. That old command is the same as the message you have heard. Beloved, I write not a new commandment to you, but the old commandment, which ye have had from the beginning; the old commandment is the word which ye have heard from the beginning. Brethren, I write no new commandment unto you, but an old commandment which ye have had from the beginning. The old commandment is the word which ye have heard from the beginning. Brethren, I write no new command to you, but an old command which ye had from the beginning. The old command is the word which ye heard from the beginning. Brethren, I write no new commandment unto you, but an old commandment which you had from the beginning. The old commandment is the word which you have heard from the beginning. Dear friends, I am not writing a new commandment to you, but an old commandment which you have had from the beginning. The old commandment is the message which you have heard. Brothers, I do not write a new commandment to you, but an old commandment which you had from the beginning. The old commandment is the Word which you have heard from the beginning. Brethren, I write no new commandment unto you: but an old commandment which ye had at the beginning. For an old commandment is the word which ye heard from the beginning. Beloved, I am not writing you any new command, but an old command which you have had from the very beginning: the old command is the word you have heard. Beloved, I am not writing a new commandment to you, nay, and old commandment, which you have had from the beginning. That old commandment is the message to which you have listened. Dear friends, I am not writing a new commandment to you, but an old commandment which you have had from the beginning. The old commandment is the word that you have already heard. Beloved, I write no new commandment to you, but an old commandment which you had from the beginning. The old commandment is the word which you heard. 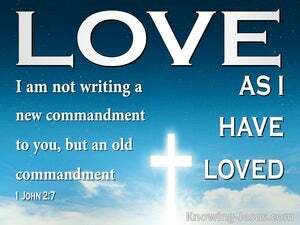 Beloved, I write no new commandment to you, but an old commandment, which ye have had from the beginning. The old commandment is the word which ye have heard. Beloved, I write not a new commandment to you, but an old commandment, which you had from the beginning; the old commandment is the word which you heard. Beloved! no new commandment, am I writing unto you; but an old commandment, which ye have been holding from the beginning: The old commandment is the word which ye have heard. Brethren, I write not a new commandment unto you, but an old commandment which ye had from the beginning: the old commandment is the word which ye have heard from the beginning. Dear friends, it is no new command that I am writing to you, but an old command, which you have had from the first. That old command is the Message to which you listened. My dearly-loved friends, it is no new command that I am now giving you, but an old command which you have had from the very beginning. By the old command I mean the teaching which you have already received. Dearly beloved, I am not writing you a new command, but an old one that you have had from the beginning. That old command is the message that you have heard. Brothers, I write no new commandment to you, but an old commandment which you had from the beginning. The old commandment is the word which you heard from the beginning. 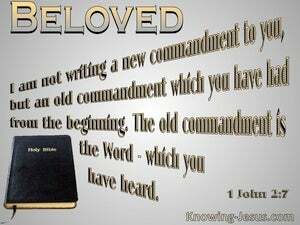 Beloved, I write no new commandment to you, but and old commandment which ye had from the beginning. The old commandment is the word which ye heard. 6 the one who says he abides in Him ought himself to walk in the same manner as He walked. 7 Beloved, I am not writing a new commandment to you, but an old commandment which you have had from the beginning; the old commandment is the word which you have heard. 8 On the other hand, I am writing a new commandment to you, which is true in Him and in you, because the darkness is passing away and the true Light is already shining. As for you, let that abide in you which you heard from the beginning If what you heard from the beginning abides in you, you also will abide in the Son and in the Father.